​Taiwanese pianist and film composer Hung-Tao Lin enjoys an active musical career throughout Asia, North America, and Europe. He began piano studies at the age of three, and although his parents pushed him to prepare for medical school he decided to pursue a career in the arts. In support of his studies he has received scholarships from Academy Award-winning director Ang Lee, the USC Thornton School of Music, and the Taiwanese Ministry of Education. 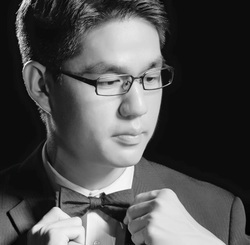 He has garnered top prizes in piano competitions in Taiwan including first prize in the national finals of the 2008 Taiwan Student Music Competition, and first prize in the Taiwan finals of the 2007 Vienna Music Education National Music Competition. Recent accolades include winning the 2016 National Beverly Hills Auditions, 2016, Gold prize in 2016 Seattle International Bach Festival, and Honorary Mention in Budapest Division of 2016 Los Angeles International Liszt Competition. Dr. Lin has scored over sixty films, including the documentary feature “Absent without Leave,” which was nominated for awards at the 2016 Busan International Film Festival in South Korea. He holds a Doctor of Musical Arts in piano performance from the University of Southern California, where he studied solo piano with Kevin Fitz-Gerald, collaborative piano with Bernadene Blaha and Dr. Alan Smith, and film scoring with Emmy Award-winning composer Bruce Broughton. He also holds a Bachelor of Fine Arts in film with a minor in music from the National Taiwan University of Arts.